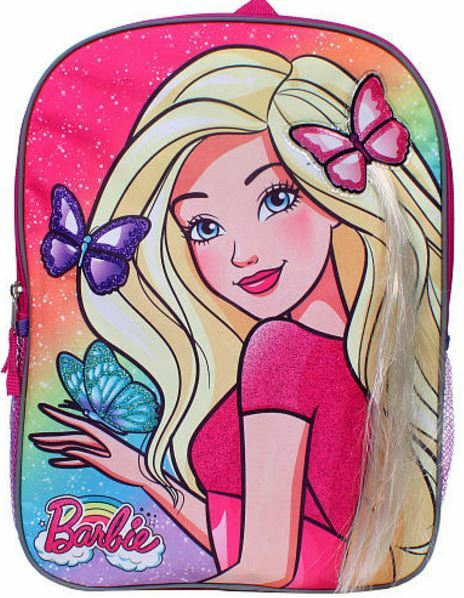 Barbie Butterflies 16 x 12 x 5 inches Backpack Exclusive For Tru. 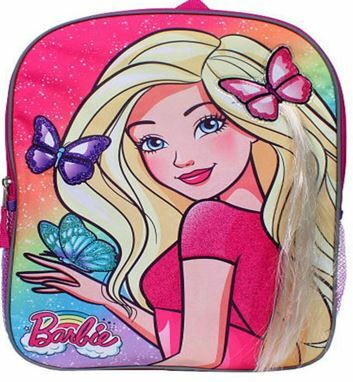 Featuring Barbie with PVC Butterfly patch and 3D hair. Includes a Butterfly hair clip with blonde hair extension. Toys'R'Us recognizes that at any given moment in history, Barbie® is a reflection of the times and always culturally relevant. Barbie® is the world's only brand that allows girls to imagine themselves as a mermaid to a movie star, a fairy to a fashionista, and a princess to a president. With various doll styles, accessories, playsets, along with role play costumes and collectibles, Barbie® is on-trend without being trendy, classic without being outdated! The Barbie® brand serves a purpose to girls as they try on different personalities, careers, and explore the world and all of its possibilities without ever having to leave home! Although the Barbie® brand roots are as a fashion doll, it has grown into a fashion and lifestyle brand, spanning numerous product categories...all available right here at Toys R Us!